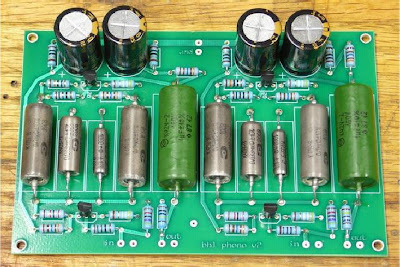 UPDATE - 10 July 2011 - Mark's review of the Boozhound Laboratories JFET RIAA Phono Preamp Kit. I have a hand full of 2SK170's and a mile of vero-brd (strip brd.) and I'm on holidays. I would like to have built boozhound's kit, I like the Russian caps, still may. But for now I have all the parts in metal film Rs and and quality polypropelene caps. The K295 (current project) must be finished first. Yummy! Look at all those PIO caps! The PCB layout looks good and the bottom is pretty much a solid grounding plane. I'll be looking forward to see how you make out with this ine. How much does the kit cost and where can it be purchased? It sure looks yummy indeed! If you follow Boozhound's eBay link it doesn't make much sense. If I find more I will post it. I picked up a smaller pin vice today to allow me to roll better vero-brd. (strip brd) creations. This time the boozhound "La Pacific" jFET phono pre. About to start. This build may end up in a gold embossed chocolate box. Before you laugh it has a hard top and a sun roof. Now I have your attention. I wonder if it will be sweet sounding. Here is the cct. brd. finished. The only other part to grace the vero-brd. is possibly a 10,000uf cap. See the brown polies all-in-a-line. Make you smile that does guv! Cct. brd. is complete with a 10,000uf cap (snubbed) across the 27V PS rail. A 1ohm resistor sits between the PS and the big cap (a la Pass). Also each channel has two 220uf lows ESR caps (also snunned) at either end of the V+ rail after the 10R de-coupling resistors. WireWrap wire (WWW) is used as hook-up wire for signal and PS. Silver solder used thoughout and gold RCAs on the back. I used 2SK170 jFETs BL (50 cents each, why not)? Did I mention it is all housed in a gold embossed chocolate box. Those who know me are probably not suprised. Also the box has a clear plastic cover under the gold embossed top. The top and bottom of the box are lined with bitumanised Al foil. Currently the unit is powered by three 9V lithium batteries. 1mm pure silver wire hooks all the earths up and multiple strips are ganged together for the V+ and neg (earth) rails. The input wires and the PS wires have tiny ferrite beads on both the hot wire and ground. The input hook-up wires are not sheiled (I don't like the stuff) but the WWW is heavily twisted with the earth wire. How does it sound? By far the very, very best phono preamp I have ever, ever made. All my other preamps, both tube and OPAMP based have a very slight background hiss and thermal noise. This has absolutely no back ground noise or sound of its own. It is dead, dead quite. The brown polies are doing a fabulous job of letting the music through and I feel, adding nothing. I have not heard my vinyl ever sound this good. It feels (sounds) lite and airy. Beautifully transparent and detailed with a very rich extended bass. Bass is weighty and detailed. This, for me, is a huge step-up in my vinyl appreciation. I'm rapped!! Just a note. The cct. called for a .034uf cap. The way boozhound does it is with a .033 and a .001 cap in parrallel. I could not get these in the high voltage polypropelene caps I used. So I used two .068uf caps in series. This give the required .034uf. For god sake if you play vinyl make one now. All you need is a few caps, Rs and chocolate box. Seriously good. Very nice Mark !! The alligator skin pattern is exotic. I find for solid state projects, any Jfet based circuit is always smooth and pleasant to listen to. No surprise you are enjoying this one. Really? I want to listen to it. A jFET can beat a triode phonostage????? Theoretically, a jFET gets similar transfer curve of a pentode with a kinked knee which cannot touch the linearity of a triode, let alone the 3rd & higher odd orders of harmonic distortion a bipolar generates. May I suggest you to take a few weeks to audition in depth with complex orchestral works & vocals before you comment on how superior it would be. Personally, I am yet to listen to any SS phonostages, irrespective of DIY, brandname & pricing, that can touch a very good triode tube phonostage. PS: I am listening to my DIY one-stage triode passive RIAA phonostage. For air & spacenes & vocal interpretation, I dare say it is second to none, yet. Of course no matter what we build or purchase there is always something better. I have to admit I have not listened to a high-end tube phono preamp. What I was stating is this is the best I have made compared to OPAMP and JAN6418 based units I have made in the past. And it is the best I have heard with relation to other DIYers and audio club members systems. With the others I have made (about five of them) there always apeared to be a background "rush" of thermal noise. This baby, nothing at all. Also with the other I always felt I was listening through some sort of sonic filter. That is not there any more. I will get about 4 to 5 hours today to listen to a large variety of music. I have to admit once more I only got a short listen late last night. But compared with the phono preamp I have been using over the last year or so the improvement was instantly obvious. This design, I believe, has been based on the La Pacific. Itself a very simple and much regarded design. I think Boozhound just improved on it. With phono preamps requiring huge gain component selection and placement is critical if you want best results. I think boozhound has made a very good choice with the PIOs. Also I like the way he has set-up the PS with the 10ohm de-coupling resistors and storage caps at either end of the cct. Good clean power is essential. I added the 10,000uf cap and also 300ohm gate resistors. Another nice aspect of this phono preamp is that it is dead easy to build. No high voltage and a project you could complete in a day. A nice vero-brd. (strip brd) fancy. At the end of the day you would have yourself a very nice and very cheap to build phono preamp. And one which would definitely impress. Is it possible to post the schematic directly to this thread, please, I don't have any way of viewing data sheets at the moment. Looks like I have another small project on my hands though.